Very nice campground. Our site was large, level and right next to the lake. Beautiful lake view! Easy to back into. We camped early May, so the water taps were not on, yet. You had to fill up fresh water at the dump station, which was 5 miles down the road, so bring a fair amount of fresh water with you if you go this early. Cold at night; used our furnace every night. But NO BUGS! (mosquitoes just starting 2nd week May). Highly recommend! 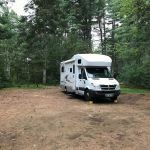 We camped at Algonquin Provincial Park - Mew Lake Campground in a Fifth Wheel. Hiking trails are fabulous. We did Big Pine Trail, and Beaver Pond Trail. Rented a canoe, and paddled Whitefish Lake for a couple hours. So peaceful and quiet at this time of year. Go to visitor center and have their Poutine fries. Delicious! There is easy access to hiking and canoeing along route 60. The Visitor Centre and Logging Museum were fun and informative. Are you affiliated with Algonquin Provincial Park - Mew Lake Campground ?